Our Swim Team Program is not available to masters swim teams, as we find that masters swimmers have lost so much flexibility that they are unable to correctly perform our drills. We recommend our Individual Program for masters swimmers. Conventional swim instruction is based on on-deck coaching, a technology that is more than 2,000 years old. On-deck coaching started when the first coach stood on the shores of a lake and yelled to his swimmer in the water. With on-deck coaching, a swim coach stands on the deck and tries to teach stroke technique while not being able to see exactly what the swimmer is doing underwater. Even worse, swimmers do not see their stroke either, and just assume they are doing what their coach has told them. In addition, most stroke instruction is based on subjective opinion. Some coaches prefer this theory, some that theory of swimming. Nothing is measured. Since each single stroke in swimming is less than one second, you can imagine the difficulty of coaching a large group of swimmers while standing on the deck, unable to see what is happening underwater. As a result, most swim coaching is mostly just physical training. Swimmers get faster as a result of ever increasing age and yardage, greater intensity of training, and dryland weight training. But the improvements are slow, and often swimmers plateau or even regress. The side-effects of this type of training are boredom, burn-out, shoulder injuries, and eventual defeat by swimmers who are accidentally more efficient. Somax teaches swimmers to improve their stroke efficiency with frame-by-frame underwater stroke analysis coupled with its exclusive drills and training aids. When each swimmer on your team can see their underwater stroke compared to the underwater stroke of a World Record holder, when they can learn drills that will teach them to duplicate that stroke while they swim, and when their new stroke is videotaped and measured on a weekly basis, they will swim faster and faster because they will be more efficient. The best measure of stroke efficiency is how much distance a swimmer can travel with each stroke. The longer the distance, the lower the stroke count. Average freestyle and backstroke counts for age group and senior swimmers is 14-24 strokes (single arm pulls) per 25 yards. Somax trained swimmers are so efficient that their average stroke counts are only 7-12 strokes per pool length. This unique program of frame-by-frame stroke analysis grew out of 1500 hours of research Somax conducted during 1985-7 on underwater tapes of World Record swimmers, as well as measuring many Olympic swimmers and training numerous elite swimmers over the past 19 years. Many of our findings were at variance with wide-spread assumptions about swimmers and swimming. One World-Record holder, for instance, while holding the five fastest times in the world in the 100m freestyle, had 10% less power output in his arms (as measured on a bio-kinetic bench), but 70% more power in his hips than other sprinters on his team. He also had a total of 70 degrees more range of motion in his shoulders. Janet Evans' breathing ranges were at least 50% greater than her competitor's breathing ranges, while her VO2max was only 56, compared to her competitors with a VO2max of 70-80. At the time, Janet held world records in the 400, 800 and 1500m freestyle. The elite swimmers Somax has trained have earned 43 Gold Medals and set 11 World Records in international competition after their Somax training. Independent analysis of these swimmers (hand force output curves, reduction in stroke count, and speed trials) confirmed the improvements in each of these swimmers came from their Somax training. Somax trained Amy Van Dyken at a week-long camp at Colorado Springs during the end of August 1995 at the request of her coach. Amy doubled her peak force output, and while she did not increase her stroke length at race pace, she was able to drop her stroke count while training from 30 to 15 on 50m. These graphs show that swimmers who increased the acceleration of their hips doubled the peak hand force (heavy solid line) they applied to the water after just one week of Somax training. You can see that neither swimmer produced much force until after they rotated their hips. The female sprinter was able to advance the timing of her hip rotation (thin, broken line) and thus doubled her insweep peak. The male sprinter delayed his hip rotation, and his initial hand force output was less. Then he doubled his peak force as he accelerated his hips. The female sprinter, Amy Van Dyken, won four Gold Medals and the male sprinter, Jon Olson, won two Gold Medals at Atlanta. Amy dropped her time in the 50m free from 25.03 to 24.87 (.6% drop) and in the 100m free from 55.76 to 53.91 (relay) (3.3% drop). She won four Gold Medals at Atlanta. Amy increased her AIR and hip extension ranges from 40 to 60 degrees with two sessions of Microfiber Reduction. She was able to swim free of shoulder pain after her Somax program. Unfortunately, Amy injured her shoulder lifting weights after the Olympics, and had to recuperate for a year after shoulder surgery. She re-entered competition and won two Gold Medals at Sydney. These photos show the improvement in shoulder and hip flexibility from just two hours of Microfiber Reduction. The shoulder range AIR (Abduction with Internal Rotation) is critical for keeping the elbows up during the stroke. Hip extension is critical for reducing drag. Somax trained Jon Olson during the same camp at Colorado Springs. Jon also doubled his peak hand force output during the camp. He went on to win two Gold Medals at Atlanta. Stanford hired Somax to analyze and train eight of its top women freestylers and backstrokers. 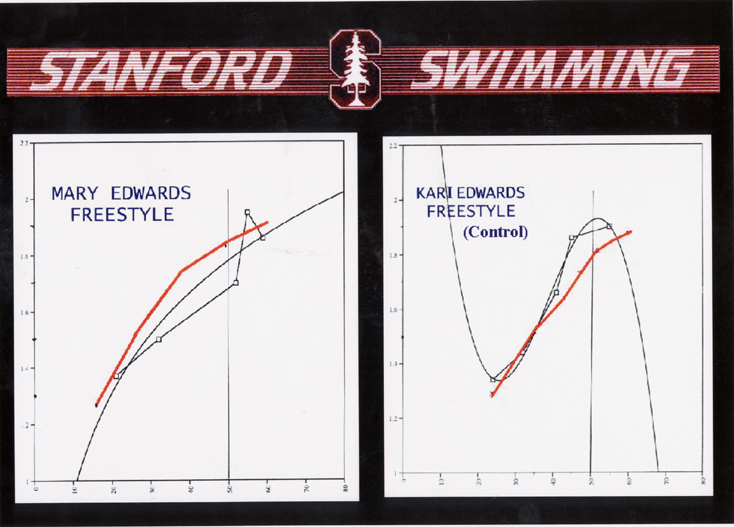 Underwater analysis showed that the two best swimmers on the Stanford team rotated their hips earlier than any of the other swimmers. All the swimmers in this group were trained to increase the speed and advance the timing of their hip rotation. There was no Microfiber Reduction. Times were taken of the entire team during speed trials before and three months after the Somax four-day training. Three months after the Somax training, the Somax swimmers were going faster than the Stanford-trained swimmers. Two of the Somax-trained swimmers went on to win multiple Gold Medals. This graph shows the speed of two Stanford swimmers at various stroke cycles. Times were taken before the Somax training (black line) and three months later (red line). As you can see, the Somax-trained swimmer on the left was swimming faster. At the NCAA's the following Spring, Stanford Women won by 80 points. The prior year, with essentially the same swimmers, they won by just 19 points. Our experience working with elite swimmers has shown us that just a five-day program of Somax analysis, drills and Microfiber Reduction doubles peak hand force output, increases flexibility and reduces times .6-3%. Since flexibility is such a big component of swimming performance, and no Microfiber Reduction is included in this program, the goals of the Swim Team Program are to reduce swim times and injuries by increasing stroke efficiency. While swimmers in our five-day camps doubled their peak hand force output and cut their stroke count at training pace 30-50%, they were not able to increase their stroke length at race pace. Amy Van Dyken, for instance, dropped her stroke count on 50m from 30 strokes per length to 15 strokes per length during training, but her stroke length at race pace was unchanged. With our Swim Team Program, we hope that some swimmers increase their stroke length at race pace, so they can swim with the same ease and efficiency as Alex Popov. This graph shows how Alexander Popov effortlessly swims world record times. The heavy solid line shows the amount of propulsive force generated by his right arm. The dotted line below shows the velocity of his right hip as it rotates toward the surface. Popov rotates his hip 5/30ths of a second before his insweep, and again 5/30ths of a second before his outsweep. Despite having a small hip rotation, he is able to generate 75-100 Newtons of force. Increasing the speed of his hip rotation would enable him to increase his peak force to 150 Newtons and swim faster. Our goal in our Swim Team Program is to do exactly this. As you can see, Popov's stroke is 50% longer than most elite swimmers. This increase in stroke length comes from his early hip rotation. 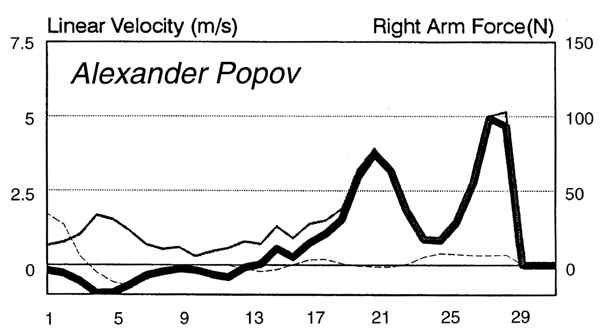 Popov rotates his hip 4/30ths of a second before his insweep, and again 4/30ths of a second before his outsweep. Amy Van Dyken was able, in one week, to advance the timing of her hip rotation 2/30ths before her insweep and outsweep. With constant practice of our exclusive drills and bi-weekly underwater videotaping and analysis of stroke mechanics, we hope that some swimmers in our Swim Team Program will advance the timing of their hip rotation to 4/30ths of a second before their insweep and outsweep. Our program will teach your swimmers to increase their stroke efficiency through frame-by-frame underwater stroke analysis, our exclusive drills, training aids and stretches. Unlike most underwater videotape analysis, our program measures stroke mechanics by the degree every 1/30th of a second, and then trains swimmers to improve their mechanics, measuring their progress along the way. Our drills have been developed over the past 20 years to increase the speed and advance the timing of hip rotation, the real source of power in freestyle and backstroke. We have found that the power in fly and breast also comes from the hips, and have developed drills and methods of analysis for these strokes as well. Our training aids for this program includes the Somax POWERBELT, the only training aid that provides resistance to hip rotation, thereby increasing the strength and speed of this essential and critical movement. The POWERBELT consists of a pair of fins that strap onto the hips and provide resistance to hip rotation and undulation, the real source of power in swimming. In addition to the POWERBELT we will make available to swimmers in this program new training aids developed by Somax. For further information on our training methods, please see Swimming, The Hidden Secrets of World Record Swimmers, Microfiber Reduction, Tension Reduction, Stress Reduction and Breathing. Your team will send us two or more instructors (or parents) for a two-week training program for each stroke. The first week the instructors will be taught to perform all the drills, analyses, stretches, and strength exercises for that stroke, as well as our program for Stress Reduction. The second week the instructors will practice teaching under our supervision. Some parents and/or instructors may be too stiff to perform our drills. They will need to complete a program of Microfiber Reduction before starting their training program. For this reason, we require photographs and measurements of their ranges before camp registration. Contact us for details. The instructors will then return to your team and teach the swimmers, instructors and parents our program of drills, analyses and exercises. We believe it is important that everyone on your team learn and understand underwater stroke mechanics. In this way, everyone will be on the same page. Parents and swimmers will be able to understand why someone is improving, and why they are not. Parents and older swimmers on the team will be able to help the coaches analyze and supervise drill sets. You team will be more unified when everyone has the same goal: the most efficient stroke for each and every swimmer on the team. We recommend teaching our program in four six-hour days--three hours each morning and three hours each afternoon. Two hours each morning and two hours each afternoon are spent learning in-pool drills. The drills are first taught on the deck with the assistance of the parents and coaches. One hour each morning and afternoon is spent measuring and analyzing the tapes made in the pool. Before any swimmers are analyzed, you will show underwater tapes of World Record holders, measuring and analyzing their stroke mechanics. Once swimmers see their own stroke compared to a World Record holder, they will clearly see what they need to improve. You will then teach them how to improve their stroke with our exclusive drills, training aids, stretches and exercises. You will also teach the instructors and parents how to videotape with an underwater camcorder. If you do not already have camcorders and attachments that can tape underwater, we can direct you to suppliers who have excellent equipment for this purpose. Modern underwater attachments to camcorders allow you to stand comfortably on the deck while videotaping underwater. Each detachment has a waterproof underwater lens. The waterproof lens is separated from the camcorder body by an extension pole that attaches to the bottom of the camcorder. A parent or coach (or swimmer) stands on the deck, lowers just the lens below the water surface, and can see the swimmers on the LCD screen. Each swimmer is taped from the side and front (and back with breaststroke). The tapes can then be played back with frame-advance so the swimmers can see what they are doing every 1/30th of a second. Every swimmer gets instant visual feedback to see whether or not they are doing their drills and stroke correctly. It is the fastest, most efficient way to teach swimming. This may sound complex compared to on-deck coaching, but it is so much more effective, and actually very simple once you get used to the new approach. To give you an idea how effective our program can be, one ten year-old boy reduced his stroke count on 50 meters from 62 strokes to just 15 strokes in just five days. This same 10 year-old had plateaued for a year prior to his Somax program, but then dropped his 200 free time from 2:19 to 2:09, and went on to win 9 Gold Medals at his state meet, setting three state records in the process. Once swimmers get to see their stroke underwater, they will never want to go back to on-deck coaching again. Also in each clinic, you will teach your swimmers how to measure their flexibility and strength. We provide Stretchcards and Strengthcards for them to keep track. We also provide Strokecards to keep track of stroke counts. Every week the swimmers will get to see their stroke and drills on tape. Every week they will measure their strength and flexibility for swimming. Each week they will see improvements. Week by week they will see their stroke counts dropping, they will go through the water more smoothly, and as they improve their drills, their pace will increase. Then they will see their times dropping as they take their new stroke to competition. As you can see, the Somax Swim Team Program engages the mind much more in swimming than current swim training. Swimmers will learn about muscles and physiology, stroke mechanics, how to measure and keep records, and how to set and meet goals--all skills that will help them later in life. Once your team members have completed your clinic, they will train with the Somax drills each day. For each stroke we have developed a 2500 yard or meter drill set consisting of 12 different drills that will develop and integrate the skills needed for an efficient stroke. While it is possible to teach an efficient stroke in four days, we find that it takes 3-6 months of daily practice of our drills in order to learn the new stroke well enough to be able to race with it. For this reason, we recommend spacing the clinics over 2-3 months so that the swimmers have time to practice their new drills and get comfortable with each stroke. In order to race with an efficient stroke, the swimmers need to practice the drills correctly. For this reason, we recommend that every swimmer see their stroke at least once a week. After they have practiced for 2-3 months, it will be helpful for them to see their stroke at race pace in order to see which new skills they are bringing to their racing stroke, and which ones are missing. Somax performance specialists will be available for follow up if your team needs it. This can be done over the Internet. We can download underwater tapes you send us onto our website and analyze the tapes for you. You can then see our analysis on your home computer. Our fee for follow-up Internet stroke analysis is $700 per analysis. We also have performance specialists who can travel to your team for follow-up. Instruction fees are $30,000 for each stroke, for teams with up to 100 swimmers. If you have 30 swimmers on your team, the fee will be $1,000 per swimmer for that stroke. If you have 100 swimmers, the fee will be only $300 per swimmer. For teams with more than 100 swimmers, or national governing bodies that want to license our swim training program, please contact us. The instruction fees are due at the time the program is scheduled, and they are not refundable. The Somax POWERBELT is an additional fee of $50 for each swimmer and all are made to size. As swimmers grow, they will need to replace their POWERBELT with a larger unit. We offer a discount if their POWERBELT is returned in useable condition. Underwater camcorders and attachments and a dynamometer to measure strength are extra. Fees include all instruction for your instructors, and Stretchcards, Strengthcards and a laminated drill card for each swimmer. Fees are a license to use the information and POWERBELT for only the swimmers who have paid for the program. All drills, methods of analysis and POWERBELTS remain the property of Somax. All swimmers, coaches and parents will be required to complete a non-disclosure form prior to the first clinic. We recommend that your team start with the freestyle clinic. Then, if you find our program worthwhile, you can schedule subsequent programs every 2-3 months in order to learn the drills and underwater videotape analysis for each stroke. Once all swimmers on your team have completed all five programs (free, back, breast, fly, starts and turns), we will then license your team to train new swimmers with our program for a reduced fee. Your team must have a pool at least 25 yards in length with a minimum of four lanes and 82-degree clear water in order to teach and videotape our drills. Because the drills are done slowly, you need a warm pool. You will also need a nearby room with mats or carpets for stretching and a large television set to view underwater videotapes. Minimum age for this program is five. All fees and registration cards must be collected and sent to Somax at least three months prior to each clinic so that we can schedule instruction for your instructors and Powerbelts can be custom-made for each swimmer on your team. Microfiber Reduction, our exclusive form of connective tissue massage that improves flexibility far beyond what stretching alone can do, and Tension Reduction, our special program to reduce muscle tension, are not included in our Swim Team Program. Normally, they are only available as part of our individual programs or camps. However, they can be made available to your team members who are enrolled in our program on an individual basis. Please contact us for information and fees. To register your team, please contact Somax. For a small fee, we have an information package that you can order that includes a video of our program, as well as articles and research results to distribute to your team members. * Somax guarantees that your team swimmers who successfully practice our Swim Team Program will swim faster within one year of completing your clinic, or their individual fee will be refunded to the team. This money-back guarantee is extended to all able-bodied swimmers who complete our Swim Team Program and meet our minimum flexibility requirements. To qualify for the guarantee, swimmers must be able to verify by videotape that they have completed our 2500-yard drill set each day, seen their underwater stroke on videotape at least once a week, and have corrected their stoke faults. They also must not do any training regimen that we find reduces their flexibility, causes them to be over-trained, or degrades their stroke efficiency. If, after one year, they do not improve their efficiency, we will refund their tuition on an individual basis. If a swimmer leaves the team, quits swimming, or suffers an injury or illness that prevents them from training, their guarantee is void.